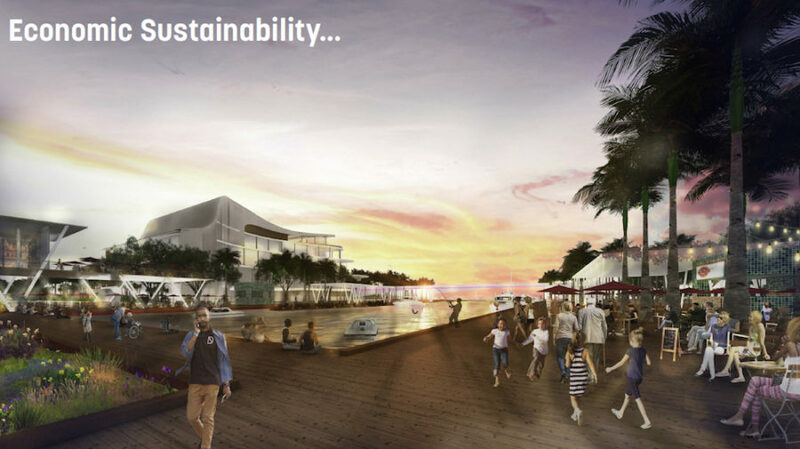 Through a series of votes, the Sarasota City Commission has given its approval to the overall master plan for a 53-acre bayfront park encompassing a new performing arts hall and plenty of public space — with access to come partly in the form of three pedestrian bridges over U.S. 41. 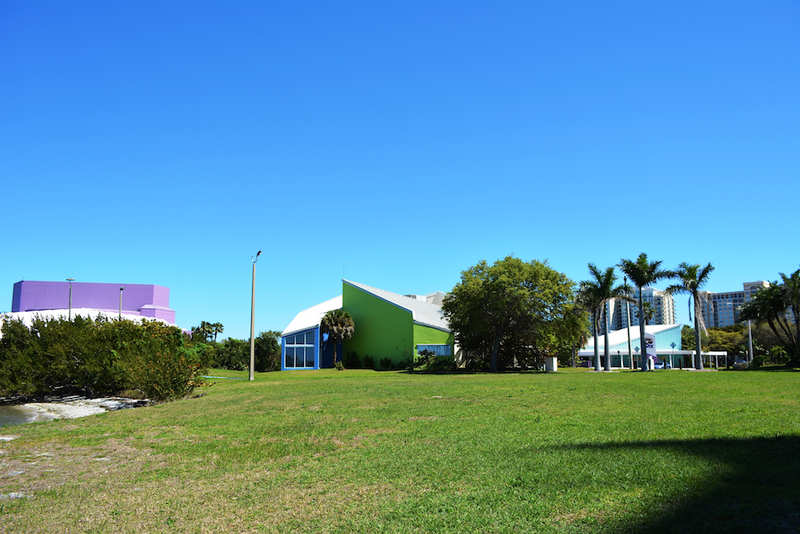 However, during a special meeting on Sept. 6, the board split 3-2 on a motion by Commission Hagen Brody to authorize the Sarasota Bayfront Planning Organization to proceed with implementation of Phase I of the project. Vice Mayor Jen Ahearn-Koch and Commissioner Willie Shaw were in the minority on that vote. “I’m thrilled with what you guys have accomplished up to this point,” Brody told the project team members. Ahearn-Koch’s concern was the future of the former G.WIZ building, as she made evident early during the discussion. 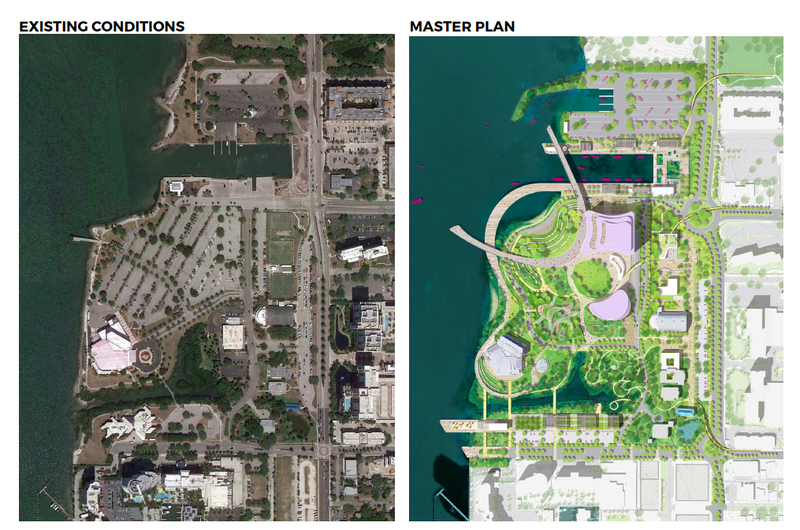 She spent slightly more than 30 minutes pleading the case for the structure to be repurposed as part of the new waterfront amenities, engaging in debate with representatives of the Sarasota Bayfront Planning Organization (SBPO) and the Boston-area design team the SBPO hired almost two years ago — Sasaki — to create the master plan. Shaw did not offer any reason for his “No” vote. “The most vulnerable building in the city [because of anticipated sea level rise and threats of flooding] is the G.WIZ,” SBPO Chair A.G. Lafley told Ahearn-Koch. Its risk score, he added, is double of that of any other city facility. The structure was the original home of the Selby Public Library, which was relocated to Five Points in downtown Sarasota. When Ahearn-Koch began to reprise some of the debate over the G.WIZ structure just prior to the vote on Phase I, Commissioner Shelli Freeland Eddie pointed out that Ahearn-Koch was repeating herself. Freeland Eddie called for the vote unless other commissioners wanted to address the issue. Mayor Liz Alpert did have comments she wanted to make, she responded. She said she felt the “group here has gone through an incredible process.” If there proved to be a viable plan for incorporating the G.WIZ building into the plan, Alpert added, she would find that agreeable. However, Alpert said she did not want Phase I to look like the area around G.WIZ at this time. Estimated at a cost between $15 million and $25 million, Phase I would focus on the southern part of the new park. It would open up public connectivity to the waterfront, Gina Ford, leader of the Sasaki team, explained to the commission. 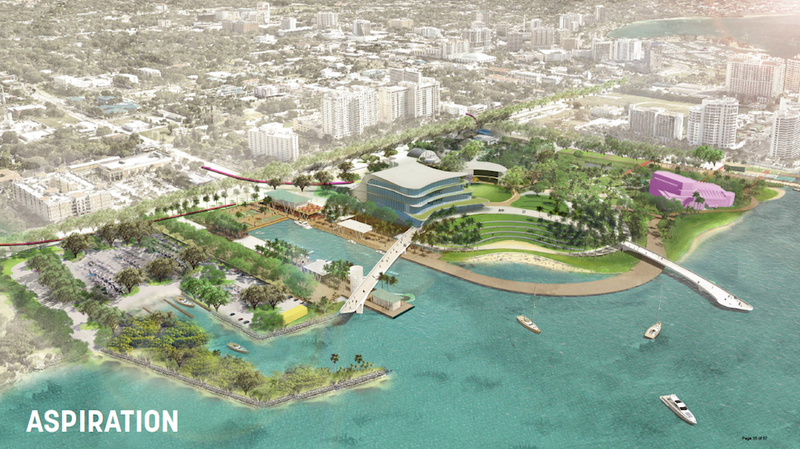 Phase I would feature green space; a pier for recreational purposes; the extension of Boulevard of the Arts, with a roundabout; the southern pedestrian crossing of U.S. 41; areas set aside for cultural programming; a new parking lot with 60 to 70 spaces and enhanced landscaping; food and beverage offerings; and restoration of the mangroves along the waterfront. It would cover about 10 acres. 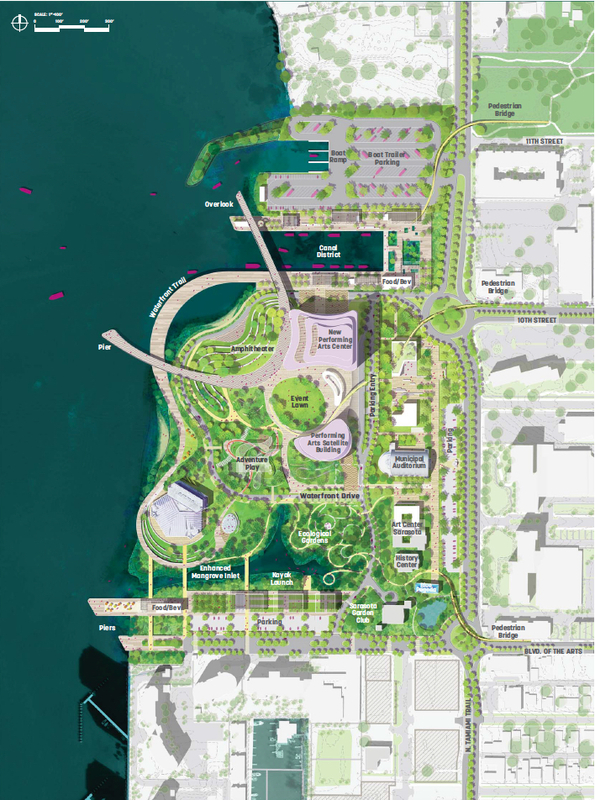 The initial investment in the new bayfront amenities — what Ford referred to as Phase IA — is expected to cost $4 million to $8 million, based on documents the SBPO provided to the City Commission. 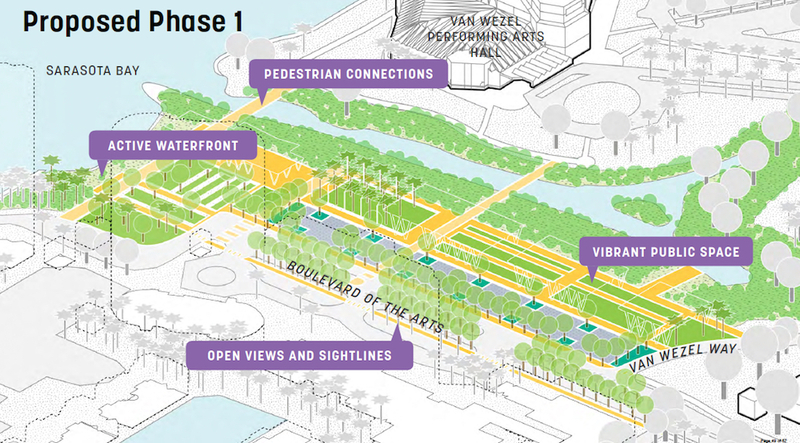 The facets of that work would include the new parking area, lawn spaces and plazas, a 3,000-square-foot restaurant/ pavilion and a series of shade structures with access to the water. Phase IA potentially could be accomplished by 2020, Ford said, with the final amenities coming as late as 2025. More than 50% of the expense of Phase IA is expected to be covered by philanthropists, Cathy Layton, the SBPO treasurer, told the commission. Among the last parts of Phase I to be constructed would be the roundabout at Boulevard of the Arts, as well as one of the pedestrian overpasses of U.S. 41. More detailed planning for Phase I was to begin Sept. 7, project team members said. “I would really like to see this become a place as soon as possible,” Ford told the commissioners. Material provided to the commission says the entire project could take up to 20 years to complete. Bill Waddill, managing director of the SBPO, told the commissioners that federal and state financial assistance likely would be needed for the three pedestrian bridges over U.S. 41. “We’re very optimistic about getting funding,” he added. Additionally, the group expects it will take 18 months to complete the permitting process for the pier/bridge that is a key focal point of the master plan, Waddill noted. Among other unanimous votes the commissioners took on Sept. 6, they agreed in principle to creation of a “conservancy” that would replace the SBPO; it would operate and help maintain the park. The commission would make all decisions regarding policies and strategies related to the development, SBPO Chair Lafley explained. The 501(c)(3) nonprofit conservancy would oversee implementation of those policies and engage in fundraising. Members of the SBPO board who want to stay involved with the project would serve on the conservancy board, he continued, and new members would be sought. 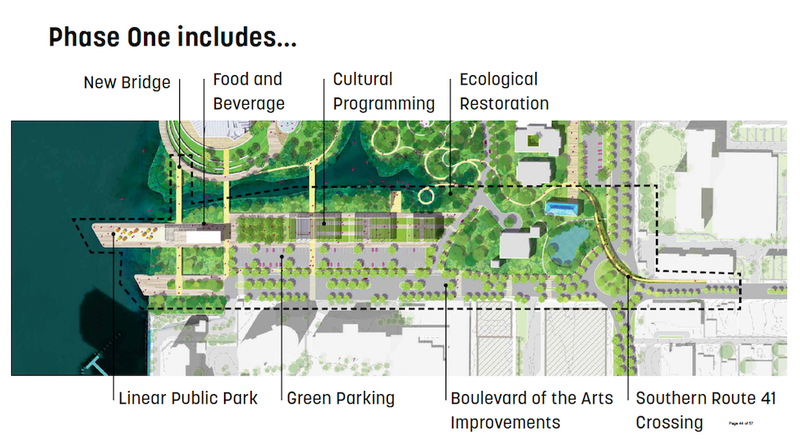 One means of helping pay for the park is a tax-increment financing (TIF) district. The commission figuratively would draw a boundary around the park and establish a base year for the value of the property within that boundary. Then, each year the value of that property rose, the tax revenue resulting from the difference between the higher value and the base value would accrue to an account for use on facets of the project. Cathy Layton, the SBPO’s treasurer, explained to the commissioners that she chaired a financial feasibility working group that included Assistant City Manager John Lege and Sarasota County Deputy County Administrator and Chief Financial Management Officer Steve Botelho, along with other community residents with expertise in bonding and public-private partnerships. Additionally, Layton said, Sasaki had on its project team “one of the very best companies in the world” that handles projects such as The Bay — HR&A. Candace Damon, vice chair of HR&A, which has offices in several U.S. cities — including New York and Los Angeles — suggested the TIF model for helping fund the overall project. He was not recommending all of that money go toward The Bay, he stressed. Instead, he said he hoped $40 million to $50 million could be used for the project. Michael Klauber, an owner of Michael’s on East in Sarasota, pointed out to the commissioners that the process culminating in the Sept. 6 votes began in 2013 with a nonprofit organization called Sarasota Bayfront 20:20, which he headed. That led to the creation of the SBPO, he said, and the hiring of Sasaki to develop the master plan. The three pedestrian bridges over U.S. 41 to the park will provide connectivity to key sections of the city, Ford noted. 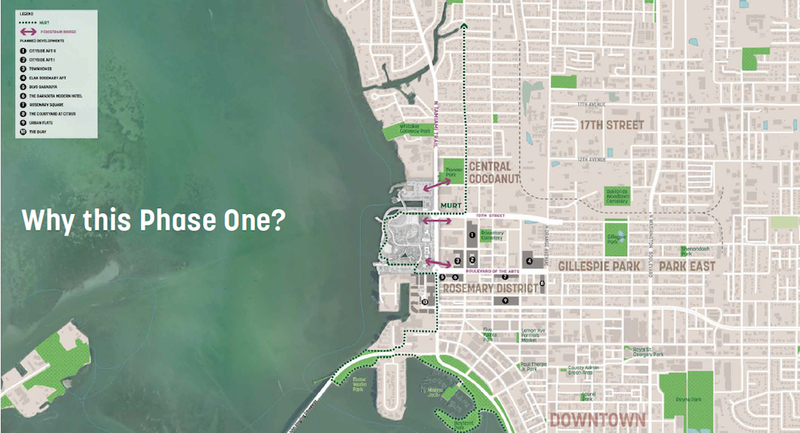 One would connect Pioneer Park to Centennial Park; the second would connect 10thStreet to the new performing arts center; and the third would use Boulevard of the Arts as the link to downtown Sarasota and the Rosemary District. During the first part of the Sept. 6 discussion, Vice Mayor Ahearn-Koch held up letters from several organizations representing community architects and advocates of historical preservation. “I think it’s a big mistake to start this project off with your first step being the demolition of a piece of Sarasota’s history,” she said of the G.WIZ building. Lafley, the SBPO chair, emphasized that the process to arrive at the master plan proposal had entailed more than 100 community meetings over the past 21 months, but only one or two of the entities she mentioned that night had “connected with us,” to his knowledge. Based on an estimate in the 2011 study, Lafley said, the cost then to renovate 9,000 square feet of the structure for a history museum was $400 per square foot. Without factoring in inflation, he continued, that put the expense of renovating the total 33,000 square feet at more than $10 million. “Those numbers, I believe, are exaggerated,” Ahearn-Koch replied. What she was requesting, she added, was that the SBPO “engage the community” about how to repurpose the structure, and then determine an estimate for the expense. The city’s own Historic Preservation Board voted on Aug. 14, Ahearn-Koch continued, to recommend that the City Commission pursue potential new uses for the building. It is 42 years old, she said. “They hired a world-class architect and engineer” to handle its construction, she added. Lafley concurred with that view. Damon of HR&A pointed out that in Seattle, city leaders were considering workforce development programs in food and beverage services in a park similar to The Bay. “Point made. Love you,” Shaw replied with a smile. Leaders of a similar project in Cincinnati made the choice that all food and beverage operations would be operated by local businesses, SBPO Chair Lafley said. When Commissioner Freeland Eddie made motions later that night regarding the conservancy and other documents related to management and oversight of The Bay, she directed staff and the SBPO to work on language that would encompass elements of Shaw’s discussion with the project team. During the presentation, Ford of Sasaki showed the commissioners a series of slides depicting examples of activities in the park at different times of day and on different days of the week. On a weekday at lunchtime, she said, some people could enjoy picnics in the open space while others could be engaged in games or enjoying an art installation. Perhaps people learning how to use a trapeze would be enjoying a class in another area, while students in STEAM classes were involved in educational activities. STEAM, she said, stands for Science, Technology, Engineering, Arts and Math. Finally, she noted, people could be fishing from the pier. On a Friday night in the summertime, she continued, people could be dining in the 3,000-square-foot restaurant, looking through telescopes at the stars, enjoying a light festival on the water and admiring the works of local artists. “We really think this is an extraordinarily ambitious legacy project for the community,” Ford added. Looks lovely, but where is the close parking to Van Wezel? and the new Performing Arts Center for older citizens who cannot walk those beautiful big paths?